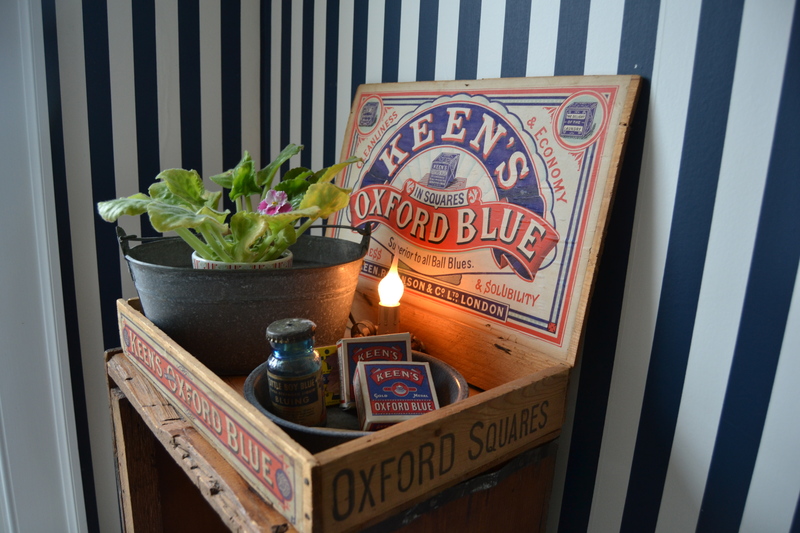 This entry was posted in Days at Home and tagged african violet, larkin soap, laundry room. Bookmark the permalink. Where’s the dirty laundry? LOL. Your laundry room is so beautiful, neat and organized. You do not want to see mine. Now I have laundry room envy. How beautiful! My grandmother always grew them but I have never had any luck. I’m with Renee; laundry room envy. Yours looks like something out of a magazine! Very sweet little violet bloom! The laundry room is so neat and tidy, it almost makes me want to get up and straigten mine up 🙂 Enjoy your Monday Dianna! I love African Violets but haven’t had much success with them as I tend to drown them. Good luck with yours, it looks good so far! Your laundry room looks so bright and pretty! Have a nice Monday. What a lovely room! The violet is happy there, surrounded by the vintage pieces. Does the little ironing board have a story to tell? I’d like to hear. Your little violet must love its only little corner with light…not too much, not too little. You’re doing something right. Congratulations on the bloom and more coming. I have laundry room envy too. Mine is in my partially finished old basement. We’ve fixed up the area since we’ve lived here, but it’s not neat and pretty like yours! I love your African Violet too. My daughter’s cat doesn’t allow plants in our house. Well he does, but then he will destroy them! I have a baby spider plant that he’s been knawing away at. I put it in a cupboard at night so he won’t finish it off. Half the time I forget to take it back out. I don’t think it’s good for the plant! that is your LAUNDRY ROOM????!!!! Damn! If I had a laundry room like that I would be doing laundry the ENTIRE DAY! that is sweet. my mom grew african violets, too. I’ve always loved those. My mom has had a few over the years. I’m terrible with plants. They have to be very hardy to survive under my care! My mom used to grow these too. Yours is beautiful! And I love your laundry room! Fun! Your artistic touch is evident, even in a room dedicated to chores. Congratulations and happy blooms to you! Grandma and Mom always had violets blooming — me, not so much…. 😦 And your laundry room! OMIGOSH honk honk it’s gorgeous! 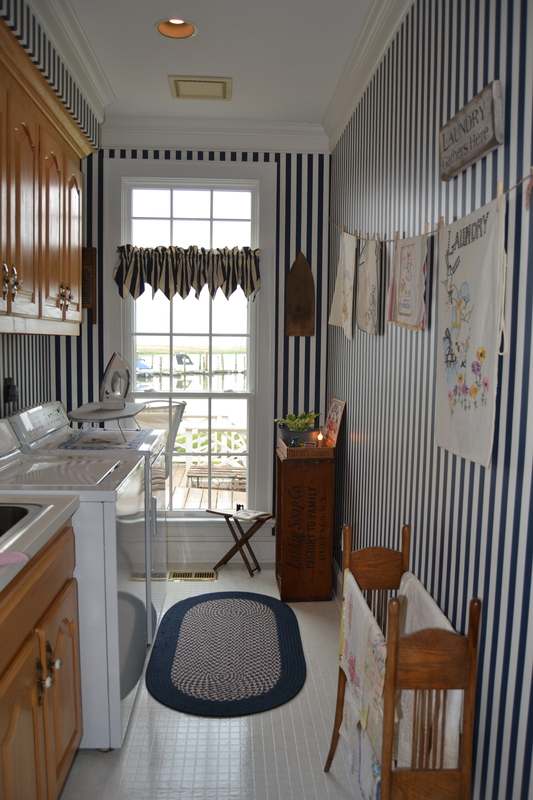 You have the cutest, most decorated laundry room I’ve ever seen. I love the little ironing board! Good luck with the violet. My grandmother had them blooming all over her house but I’ve never had any luck with them even though all my other plants are happy! I absolutely LOVE your laundry room! 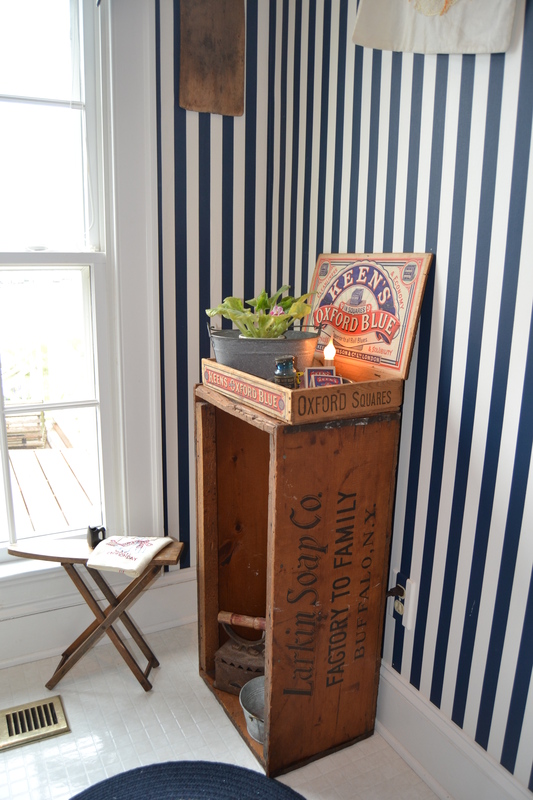 It’s decorated so cleverly and “time appropriately” with all the old-timey touches. Your violet is in a nice spot – indirect light – and if there’s one thing I have learned about them it’s that they flower in their OWN time – not ours! I think that’s great. Congratulations! And I’m sure Grandma would be proud. Everything is prefect in your laundry room and your violet just adds to it. I have a feeling you are going to do just fine with this violet. Good luck! Lovely! I kill violets just by looking at them, so gratz on the blooms! My mom is the original African Violet queen, she’s also amazing with all the other house plants. Me? Through the years I have tried and tried houseplants of all kinds, violets included but all are not overly impressed w/me! Congrats to you on your bloom, to me, that IS something!!! I kept violets for a long time, as did my grandmother. 🙂 They are such pretty plants, and very rewarding! Ok, first of all – that laundry room is stellar! Love, love, love the look of it! It looks like a picture in a house beautiful magazine. The African violet is so sweet and pretty. I never had good luck with them either but my mom always had them on the window sill above her kitchen sink. So this made me think of my mom too. I KNOW your mom would be proud of you, Dianna! Your home is just as lovely as you are. I LOVE your laundry room! I am so jealous! You have decorated it just perfectly! 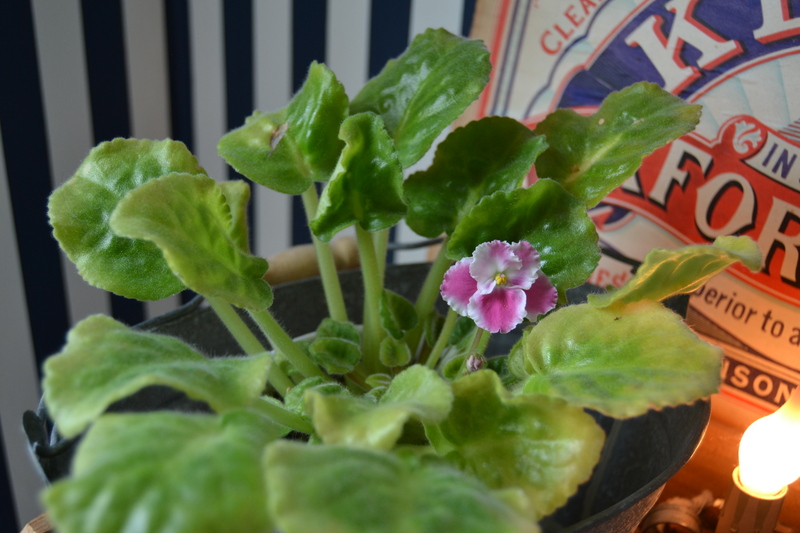 I’m happy for you that the African violet has bloomed! I know your Mom would be happy and proud.